All paper card pieces come pre-cut, make the mask by yourself with the installation instructions. Need a tape or gluing tabs to build it (not including). Robust polygon construction to survive the wildest of parties. Ideal for festivals and parties. Easy assembly in 2 hours or less. All paper card pieces come pre-cut, assemble them by yourself with the installation instructions. They are designed to fit an average head size but with a adjustable helm makes them also can be wore by kids. 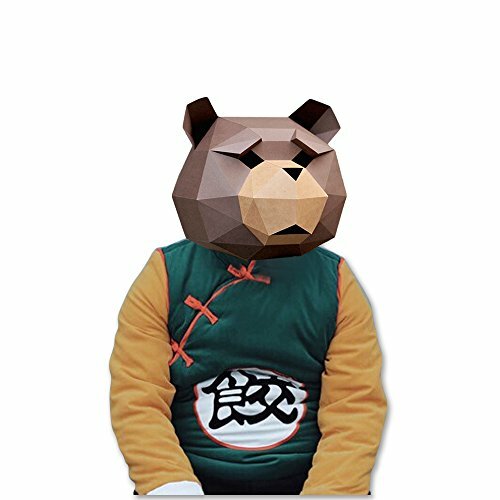 Make your own 3D geometric mask. The instructions are easy to follow and with a little patience and creativity, anyone can make their own unique mask. If you have any questions about this product by Chookie, contact us by completing and submitting the form below. If you are looking for a specif part number, please include it with your message.